2014 marks the 60th anniversary of the annual Japanese Traditional Craft Association exhibitions. As part of the celebration a major exhibition at the Tokyo National Museum took place early this year from 15 January. The show featured works by all 104 artists and craftsmen designated by the Japanese government as ‘Living National Treasure’. 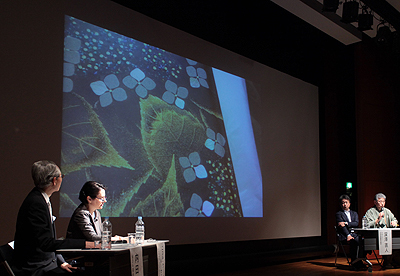 In the special symposium held in conjunction with the exhibition, Professor Nicole Coolidge Rousmaniere joined Professor Donald Keene and others to delve deep into the relevance, prominence and uniqueness of traditional craft in the 21st century. Japan is known for their master craftsmen demonstrating skills at the highest level. Perhaps backing them are the keen national awareness, appreciation and desire to keep the tradition alive. The recent exhibition ‘Engendering Beauty, Preserving Techniques: Artworks by Living National Treasures’ at the Tokyo National Museum was a momentous show celebrating craft excellence. A collaborative feat between the Tokyo National Museum, Agency for Cultural Affairs, Japanese Traditional Craft Association (Nihon kōgeikai) and other major institutions, it was the first exhibition that brought works by all 104 artists designated as Living National Treasures including 53 currently active practitioners. For a country steeped in craft tradition for centuries, it is curious that the designation system is a relatively new practice. In fact, a concerted effort to preserve intangible heritage in Japan only materialized in 1950 when the Law for Protection of Cultural Properties was passed. The enactment was an attempt to revive cultural practices and industries that were nearly destroyed by the war. As a counter measure, the law helped enable necessary actions and support to revive and restore a vibrant craft tradition. Judicial responsibilities were placed under the remit of the Ministry of Education, Culture, Sports, Science and Technology, who has since certified individuals who have contributed in retaining certain artistic skills of high value as Preservers of Important Intangible Cultural Properties (jūyō mukei bunkazai hojisha). Colloquially, these individuals came to be known as ‘Living National Treasures’. Four years later in 1954, a few of the newly designated Living National Treasures founded the annual Nihon Dentō Kōgeiten juried exhibition. The annual show became one of the most successful platforms to ‘protect and foster crafts which have high historical or artistic value’. These exhibitions were successful not only in promoting the preservation of tradition and craft practice, but also in encouraging artists to test new artistic boundaries. For over six-decades the Japan Traditional Art Crafts Exhibition has been a marker of craft excellence in Japan. The 60th anniversary exhibition at the Tokyo National Museum demonstrated the rich history and the future vision of the Japanese Traditional Craft Association through three thematic discourses: ‘Reverence for Classics and Rivalry to Them’, ‘Aiming for Lively Decorative Arts of Today’ and ‘Expanding Possibilities of the Tradition’. Over 140 exquisite and awe-inspiring objects ranging from ceramic, textile, metal, lacquer, to wood and bamboo were brought together for five weeks and visited by over 113,000 people. The exhibition was a rare opportunity to experience through the objects the achievements of craft practitioners built over generations. 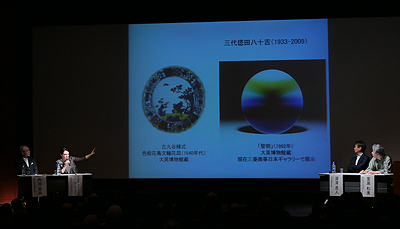 In conjunction with the exhibition was a special one-day symposium also held at the Tokyo National Museum on 25 January 2014. 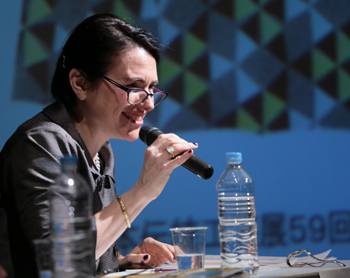 Professor Nicole Coolidge Rouamaniere, who herself has been central in fostering traditional craft appreciation and organized the 50th Japanese Traditional Craft Association exhibition in 2007 at the British Museum, was invited to speak as a panelist. After the keynote lecture delivered by Professor Donald Keene, she joined the discussion session with international product designer Fukasawa Naoto, lacquer artist and Living National Treasure Murose Kazumi, and Director of MOA Museum Dr Uchida Tokugo. The conversation explored the future of traditional craft including ways of preserving and transmitting traditional practices in a contemporary globalized mass consumerist society. Furthermore, aesthetic discussions on defining form and function in contemporary craft context illustrated the many challenges with which current artists and artisans work. In the age of large-scale production, consumption and globalization, finding innovative ways to preserve, stimulate and communicate excellence in Japanese traditional craft practices continue to be a challenge. The symposium itself drew a capacity audience of 320 people selected from 430 individuals who applied for a seat. The evening began with a keynote speech by Professor Donald Keene, Professor Emeritus of Japanese Literature at Columbia University, on the artistic and historic significance of traditional craft in Japan and beyond. Dr Uchida Tokugo, Director of MOA Museum, set the tone for the one-hour discussion session. He began by exploring the mechanics of preserving craft practices, including the traditional method of handing down skills to a hereditary member of the family, usually the son. He compared this to more contemporary trends, such as the inclusion of female artists. Professor Rousmaniere commented on the international significance of craft as an industry and as a form of artistic practice. Renown product designer and Director of Japan Folk Art Museum, Mr Fukasawa Naoto, explored craft as design and the importance on ‘making’. 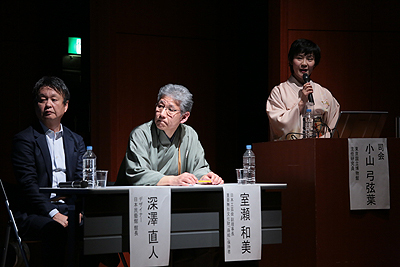 Mr Murose Kazumi, a lacquer artist who is designated as a Living National Treasure and co-organizer of the exhibition gave his perspective on Japanese traditional craft as a maker. We often associate heritage as something with material relationship. Whether it is a work of art, cultural production or historic or natural monument, we are accustomed to experiencing heritage through its physicality. Heritage, however, can be intangible. Heritage can be a way of life, whether it is that of a craftsman or community. But particularly wonderful is when the tangible and intangible heritage merge to become something special, as seen at the exhibition, where the physical (i.e. the work) and non-physical (i.e. the practice) fuse to form a single remarkable identity. While contemporary taste, lifestyle and economy all impact the way in which traditional craft is regarded and consumed, the heritage surrounding it, both tangible and intangible, continues to be an integral force that shape our individual and cultural identities. The inheritance of traditions and skills built over the generations, together with government initiatives to retain a high standard of practice, has ensured artistic lineage to flourish in Japan and help develop a collective cultural identity and memory. The ways in which the Japanese protect and disseminate its traditional craft culture is not necessarily unique, but it has certainly been successful in safeguarding its heritage.